Abstract: Games like Doom 3, Half Life 2 and currently the biggest memory hog on the market, Battlefield 2, require plenty of system memory to run properly. In computers there is an old saying that "you can never have enough memory." While that statement can be argued from both sides, I think both sides would agree that gamers can see some pretty big benefits from increased system memory.... especially with titles like Battlefield 2. The general rule of thumb is that more advanced software programs and the latest operating systems from Microsoft will use more system resources than previous versions ever did; as 'bloatware' has increased, so has the demand on our PC systems. PCSTATS recommends all new PCs be outfitted with at least 1GB of RAM, so if you're running a PC with just 512MB, it's a good time to do a little RAM upgrading. Never one not to capitalize on a new trend in memory, just as consumers are starting to see the peak of the 2GB RAM mountain poking out from behind the mist, a flurry of memory manufacturers are waiting in the winds with 'brand new' 2x1GB dual channel DDR memory kits so gamers can get their 2GB RAM fix. 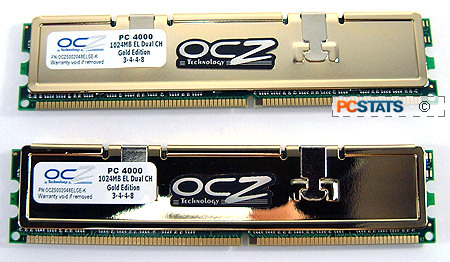 OCZ Technology is quick on the draw, and so here we are testing out its 2GB EL DDR PC4000 Gold Edition memory kit which consists of two 1024MB modules of PC4000 DDR. The retail price on these two golden babies is about available for $431 CDN ($363 US). Each memory DIMM is 1GB in size, and is rated to run at PC4000 speeds or 250 MHz with 3-4-4-8 memory timings at a voltage of 2.8V. 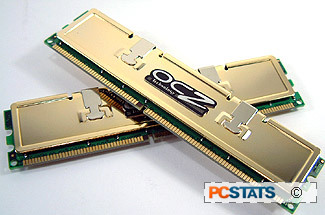 The OCZ PC4000 Gold Edition memory modules use gold plated copper Neng Tyi heatspreaders which help keep the memory safe from potential damage. Customer support is one area where memory manufacturers are heads and shoulders above the rest of the computer industry. Trying to claim warranty on components like motherboards or videocards can be quite a tedious process... system memory is by comparison very simple. In fact the typical turn around time for a memory RMA is about one business week. I have RMA'ed quite a few components to many manufacturers and from my experience, dealing with memory is the least painful. Overclocking high capacity memory is a bit more difficult since you can only go as high as the weakest DRAM module on the DIMM. Still, that will not deter us from pushing OCZ's PC4000 EL DDR as far as will go! Before we started to overclock the memory I first lowered the processor multiplier to 6x, this way the CPU will not hold back the OCZ PC4000. While keeping the OCZ EL DDR PC4000 Gold memory running 1:1, I increased the motherboard clock speed slowly in approximately 5 MHz intervals. Overclocking with 2.5-3-3-6 timings did not go too well, and at 206 MHz the system started to give us problems; it would lock up while booting into Windows. Increasing the memory voltage to 2.7V solved that issue. At 212 MHz, the memory again started to flake out, and increasing the DIMM voltage to 2.8V solved that. We ran into further problems and gave up on overclocking the EL DDR PC4000 Gold memory with 2.5-3-3-6 timings at 212 MHz. A bit fed up, I loosened the timings to 3-4-4-8 (which is default) and continued overclocking at that level. Things went along far smoother, and this time with 2.8V I easily hit the memory's default speed of 250 MHz. Unfortunately the memory did not get much higher than that and we hit a maximum speed 253 MHz. While the numbers are not the highest we have seen, I am still pretty pleased given that we're overclocking two 1GB DIMMs.